Redruth boss Steve Larkins says his side were "comfortable" as they beat biggest rivals Launceston 17-0 in the Cornish derby in National Two South. Ashley Lawton, Ben Priddey and Sam Parsons all scored tries for the Reds. "The word to describe that game form our point of view was comfortable," Larkins told BBC Radio Cornwall. "They made one break up the middle that could have led to a try, but everything else we looked really comfortable with our defensive structure." Redruth stay fifth in the division, eight points clear of sixth-placed Clifton, while winless Launceston are now 20 points adrift at the bottom of the division at the midway point of the season. 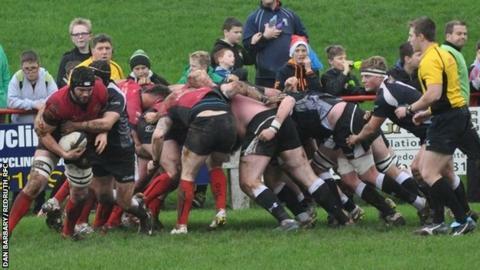 "To me the game was pretty equal with the exception that Redruth scored when they had the possession and territory, and we didn't," said Launceston head coach Jimmy Tucker. "Our boys responded and got beyond the gain-line this week countless times, compared to last week when we scarcely gave Chinnor any problems, so that's positive."